In the world of the selfie, it is interesting to note that research by a couple of Princeton psychologists finds people make first impressions of strangers in about a tenth of a second based on their face. That is about the time it takes to blink your eyes. Meanwhile, other studies have found that first impressions are so powerful, even when people are given facts about someone they will overlook them if the facts contradict their first impression. For bankers this is important because building relationships is what it is all about, so impressions matter. Compounding this issue is the simple fact that for most people, networking amongst a bunch of strangers isn't something that comes naturally. At any given function you'll likely find a mix of expert networkers and social wallflowers. But, even if you dislike these types of events, from a business perspective it's important to connect. 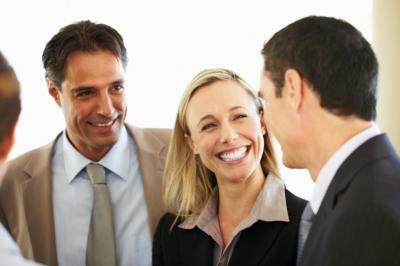 There are a number of ways in which you can brush up your networking. One way is to upload an Eventbrite app, which will give you access to a wide variety of events in your region. Separately, Ryze.com is a free and paid social networking site designed to link business professionals together. It's important to inject a social aspect into networking. Signing up for online social networking portal Meetup may be a good way to network offline with individuals with specific interests. This way you can also connect with event attendees beforehand. You can also just hang out at Starbucks and talk to anyone that looks like they are running a small business. In both online and offline environments it pays to get known for your ideas. This means building a presence and that could involve contributing to forums or blogs, or possibly even writing your own. Blogger and WordPress offer easy-to-use templates for creating a blog if you decide to go that route. Alternatively, it could mean posting an industry piece on LinkedIn. This way you can take a few topics interesting to customers and convert them into the context of the banking industry or your community. Responses to your online work can also help shape conversation. Data and analytics further help in acquiring customers and for future product positioning. When you're at an event you can convert the experience into a game to get going. Start by setting a target on the number of business cards you'll collect, or how many introductions you'll make. The key is to have fun with it because that makes the entire process easier. Another idea is to play word association games to remember names--not every name will be easy but have fun. Alternatively, you can simply set a goal to seek out the most interesting person possible, focusing on quality over quantity. At any event you may find someone lurking on the edge of the action, so look for those in need of a friend. They're your captive audience, and as you may appreciate from experience, they'll be grateful for your interest. You could also set the general terms of engagement by having your own booth at a networking event, or have your bank sponsor one. If you have an online platform, consider taking along a tablet to demonstrate your products and services. The goal is to leverage any opportunity to interact with potential and existing customers. Face-to-face or social channels are all good ways to do so. If that isn't enough, create a film by using something like Periscope to provide a live broadcast of your experience. With the right mindset and planning there's no reason to worry. Enjoy yourself and it will translate to your smiling face, which will help you create a good first impression so you can make the most out of an opportunity to engage potential banking customers. Treasuries gained, pushing yields down 4bps, primarily due to declines in oil prices. A PwC survey of corporate directors finds the time horizon primarily used when discussing company strategy is: 1 to 5Ys (44%), 1 to 3Ys (39%), 1 to more than 5Ys but less than 10Ys (11%), 1 to 10Ys or more (3%) and 1Y (3%). Fidelity research finds wealth management advisors that use technology actively have an average of 40% more assets under management, have an easier time attracting next generation staff and are more effective at expanding their geographic reach. This is some interesting data for banks to consider as well. A survey by Everplans finds that while 69% of people say they have considered drafting a will, only 34% have actually done so. Education seems to be one issue, as 95% said services and access to information about creating estate plans would move them to take action. The RMA reports a survey of community bank members finds the concerns board member respondents cited most often are: the ability to keep up with the ever changing regulatory environment (31%), understanding their responsibilities with the regulatory agencies (21%), knowledge of the banking business model and how they can participate in the leadership of the bank (16%), understanding their legal liabilities and how they can participate in leading the bank while limiting personal liability (13%), and business acumen and knowledge of the markets the bank serves (9%). eMarketer research finds internet users spend an average of 1 hour and 7 minutes per day on social media sites. Facebook reportedly has 151.8mm users in the US and is the most visited social media site worldwide according to Statista. A PwC survey of corporate directors finds 75% of directors participated in some form of board education or training during the past year and almost 25% participated in 16 hours or more of education. The Census Bureau projects there are 75.3mm Millennials, 65.7mm Gen X and 74.9mm Boomers in the US today.